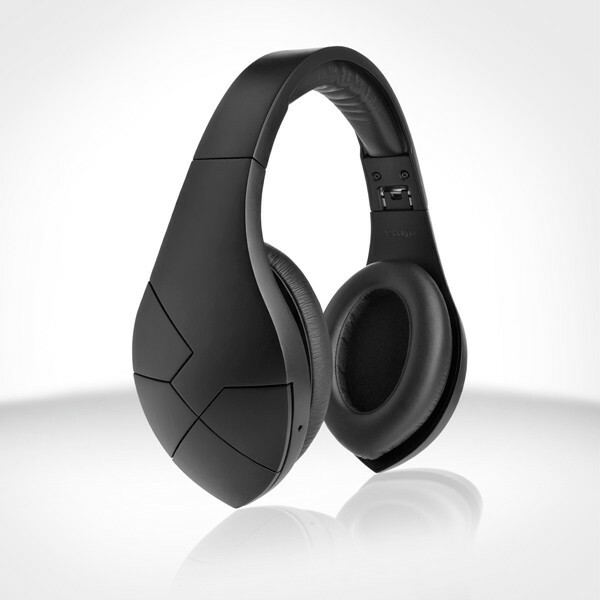 The vBolds are over the ear headphones with Bluetooth including AptX and NFC pairing. Whilst you will almost certainly have heard of that brand Velodyne are a relatively new name to UK audio. They are not a new company though having been for a long time probably the premiere maker of Sub-Woofers in the USA. A lot of this review is going to be very similar to my previous vQuiet review. Indeed it appears these are the same headphones with the noise cancelling replaced by Bluetooth. When you first connect the vBolds you will hear that SubWoofer legacy in troves particularly if you connect using AptX. AptX is an addition to the Bluetooth standard that allows much higher bandwith for audio. It isn't supported on many devices and this is one of the first headphones I have tested with it. Using a MacBooK Air as the source and ensuring the configuration showed it was uing AptX the difference was noticeable to using standard Bluetooth audio. It was like the headphones were plugged in using a cable. Velodyne rate them as having a 20Hz to 23khz range and that naturalness and clarity extends throughout, with the tests showing a very linear response with minimal harmonic distortion. This means the headphones sound clean and transparent from bass through midrange and onto the highs with a shocking amount of detail. I was also impressed that the stereo imaging was rock solid with no sense of drift between phones over the frequency range. As with the vQuiets listening to the binaural test track we have of a door being knocked on to the far left and far right had me convinced someone was actually knocking on my door and wall. The soundstage is wide and natural. At no stage did I feel closed in by these phones. Pairing these headphones on Bluetooth is exceptionally easy and even easier if you have an NFDC enabled phone. With my Nokia Lumia 920 I was simply able to hold the phone up to the NFC area on the side of the Headphone and was immediately prompted as to whether I wanted to pair with the vBolds. This is a really nice touch. In physical terms the vBolds have quite large ear pads making for a comfortable wear whatever your ear size, mine are sometimes compared to dumbo and often over the ear headphones are uncomfortable for long duration use. The Velodynes remained comfortable in many hours of use. The other thing I liked was that I was able to wear them comfortably with glasses on. I’m told by our smaller eared reviewers that they work very well with smaller ears too but smaller heads may be an issue as there is not much adjustment in the band. They do fold up but even are still a significant size but I would be prepared to make an exception to make room to carry them - they are that good. The headphones need to be charged for bluetooth use but do not draw any power when this is not being used. Power is through a Micro-USB socket and supplied USB cable which can be plugged into any USB power source such as a PC or maybe a phone charger. There is no power supply included but I agree with Velodyne that it is a reasonable assumption that most people will have some form of USB source these days. You will have gathered as with the vQuiets I really liked these headphones and I really didn’t want to send them back. They are clear, have amazing detail, are transparent across the range with fabulous natural bass. Simply the best Bluetooth Headphones I have listened to. One slight cavat though is that the Microphone which is built in to allow you to use these as a Bluetooth extension to your phone is pretty poor and people on the other end of calls often struggled to hear me - they did sound crystal clear though. If you can live with that - and to be honest I can - these are simply fabulous. Animation AV Gadgets Health Fascinating Photo TV Toys Printer Tablet Receiver iPad Router 3D Camera Gifts IP ray Stand Travel Design Home WiFi Art Photography SmartWarch Windows Charging QI Wireless Watches Phone 8.1 Software 7.1 Emergency Weather Wearable Drawing Kids Blu Robot Streaming Auto Video Home. Web Audio Tablet.